Description: A new UP GEVO leads a mixed freight west. Description: 5260 slowly sneaks through town as it heads toward Clinton, IA. Description: One of five UP locos on the southbound Eugene Hauler as it heads west to Ashahr. Description: 5260 racing under the bridge toward me and the Amtrak station in Albany. Description: All UP power on CN train M31971, has a high ball at Hammond, LA. Description: Two intermodal trains wait side-by-side for clearance through the May St. Interlocking. Description: Two GEVOs trail on the Roseville to North Platte, NE manifest (QRVNPP) as it passes through Truckee after an unscheduled stop due to one of these rear units (supposedly the UP 5260) "catching fire" (reportedly shooting flames from the stack). Cal Fire was called to the scene and stretched a hose to the locomotive. The train was stopped for about 20 minutes due to this little mishap. It is unknown whether the trains crew decided to shut down the malfunctioning unit or not before they got underway again. Description: Union Pacific C45ACCTE #5260 trails on the Roseville to North Platte, NE manifest (QRVNPP) as it passes through Truckee after an unscheduled stop due to one of these rear units (supposedly this one) "catching fire" (reportedly shooting flames from the stack). Cal Fire was called to the scene and stretched a hose to the locomotive. The train was stopped for about 20 minutes due to this little mishap. It is unknown whether the trains crew decided to shut down the malfunctioning unit or not before they got underway again. Description: Union Pacific's Oakland to Marion, AR stack train (KOAMN-07) sits waiting to depart Emeryville at the start of its trip. Description: Union Pacific C45ACCTE #5260 sits waiting to depart Emeryville on the Oakland to Marion, AR stack train (KOAMN-07). Description: Union Pacific's Oakland to Marion, AR stack train (KOAMN-07) sits waiting to depart Emeryville at the start of its trip. Leading is SD70ACe #8737, SD70M #3966, and C45ACCTE #5260. Description: Amtrak P42DC #179 leads California Zephyr #6 out of Emeryville and past the stopped KOAMN-07 stack train. Description: Union Pacifics Oakland to Marion, AR stack train (KOAMN-07) departs Emeryville at the start of its trip led by SD70ACe #8737, SD70M #3966, and C45ACCTE #5260. Description: Union Pacific C45ACCTE #5260 trails on the Oakland to Marion, AR stack train (KOAMN-07) as it departs Emeryville. 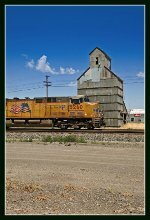 Description: Union Pacific's Oakland to Marion, AR stack train (KOAMN-07) departs Emeryville at the start of its trip led by SD70ACe #8737, SD70M #3966, and C45ACCTE #5260.